No one likes picking up dog poop so our service makes having a clean yard easy and you’ll have a healthier environment for your pets and family! Additional fee may apply for initial cleaning. Rates are based on average sized yards. Large yards may be subject to additional fee. Billing for Regular services at the end of each month after services are complete. Start or stop service at any time! To provide you with the best pooper scooper service possible. 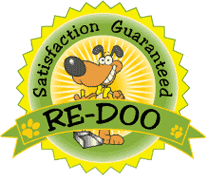 If you are not completely satisfied with a particular dog poop clean up, simply let us know. We will credit your account for that clean up, or come back to re-clean your yard. Freedom from scooping dog poop! 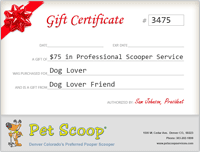 Pet Scoop has been picking up after my dog and making my life a heck of a lot easier for a few years now and I recommend them to anyone I can. Their techs are very friendly and efficient, and the customer service rocks… a great company to work with!